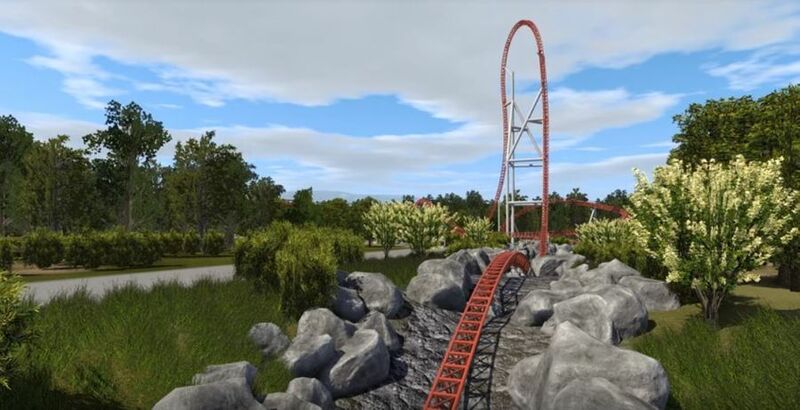 After months of speculation, Busch Gardens Williamsburg has confirmed through permits that it will be building a tall, semi-shuttle launch coaster for 2020. 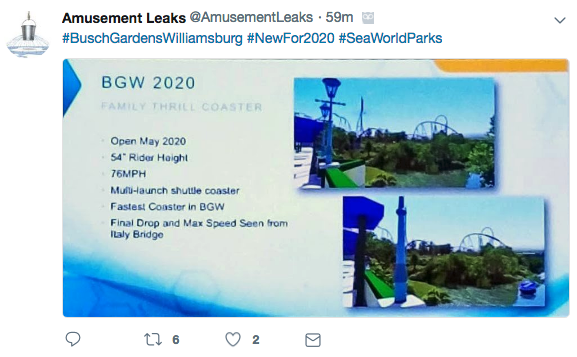 Rumors of a giga (over 300 foot tall) coaster started in September 2018 following the leaking of an internal presentation from SeaWorld Parks and Entertainment. The presentation described a multi-launch shuttle coaster that would reach 76 mph and be seen from the Italy bridge. A new article from BGWFans.com suggests that those rumors are, in fact, true. The elements of the ride are hard to discern, but there seems to be four launches – three forwards and one backwards. The train will exit the station and enter the first launch, but the most exciting element is yet to come. The train will then go into a second launch, but will not crest the rumored top hat element. Instead, it will fall back down into a backwards launch up a large spike. When the train goes into the final launch, it will have built up enough kinetic energy to clear the top hat. Images Courtesy BGWFans.com. Go check them out for the complete article! Click here to view their article with additional diagrams. If you’ve ridden the popular Sky Rocket II coasters (Tempesto, Electric Eel, Superman: Ultimate Flight, etc. ), you have a general idea of the concept. But why, then, will Busch Gardens Williamsburg be getting a similar coaster if it already has Tempesto? The answer has to do with the thrill level of the ride. Sky Rocket IIs are 150 feet tall and reach a top speed of 62 mph. The new coaster is rumored to be more than double that – 315 feet. The launch will also be faster. The triple LSM (electromagnetic) launch system works better than other hydraulic and pneumatic launch mechanisms because LSM motors require much less maintenance and are more reliable. As parks look for taller and faster rides without the high cost of maintenance, elements like this are sure to become more common. Concept art of new Intamin coaster coming to Parc Asterix in 2021. Photo by AmusementInsider. After seeing the two Intamin launch coasters unveiled at IAAPA 2018, it’s safe to say that the rumored coaster will most likely be manufactured by Intamin, which is in the process of reinventing the family launch coaster. They’re doing away with the standard airtime hills and long, flat sections of track. 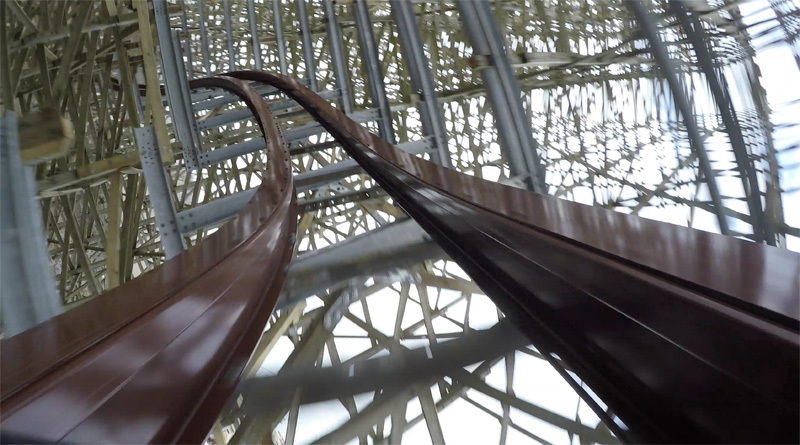 The new Intamins feature crazy airtime hills and new elements only previously seen on world-renowned Rocky Mountain Construction coasters. This means that we may be introduced to new elements never before seen on a steel launch coaster. Busch Gardens Williamsburg is known for its intricate theming, and this coaster will likely be heavily themed. However, the filed plans don’t include any buildings or themed structures, so we’ll have to wait and see. The name of the project, Project Madrid, suggests that the new are could be themed to Spain. That implies that not could we see a Spanish theme to the coaster, but the long rumored new country could also be heading to the park. It’s been rumored that the new country would open in phases, with the coaster and a few smaller shops and restaurants first, then another ride and the rest of the land a few years after. This coaster marks the third coaster coming to a SeaWorld Park in 2020 alongside Mako at SeaWorld San Diego and RMC Gwazi at Busch Gardens Tampa. It’s only the second month of the year, so there is surely much more in store! Once again, all credit goes to BGWFans.com for the design plans and original article. Stay tuned for more from Busch Gardens Williamsburg, and be sure to get social with us on Facebook and follow along with us on Twitter @BehindThrills for the latest updates! For our latest theme park videos please be sure to subscribe to us on YouTube! 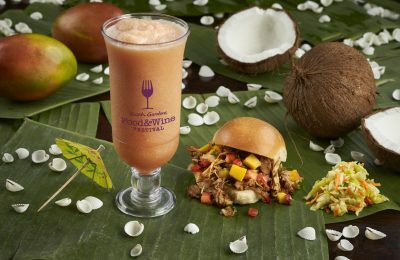 For more information about Busch Gardens Williamsburg, including tickets, visit the official website by clicking here!